Qualifying for world-level competition, in any event, at any age, does not happen by accident. Placing 16th in the world in your chosen sport takes extreme dedication. Rev. Stanley “Lee” Woods, a multi-sport athlete, Senior Games competitor, and Team USA world competitor, has spent much of his life in preparation, and he knows, unequivocally, that God has directed each one of his steps along the way. In 2014, Lee went to the Arkansas Senior Olympic Games and received five swimming gold medals and two cycling gold medals which qualified him for the Senior Nationals which were held in Minnesota in 2015. But, how did he get there? Denmark is a long way away, and Lee would tell you that this event was a lifetime in the making. A California native, Lee spent much of his youth in the water. “Whether it was surfing, skiing, diving, I was all over it.” When he was 12, he began age-group swimming, but Lee assures you that he was an average swimmer. “I was not one of the so-called ‘naturals,’ but in high school I was introduced to Water Polo, and that sport, I thought, was really cool!” Lee continued competitive swimming, but it was Water Polo that would carry him through college and sustain him afterward as a teacher and swim/polo coach. Lee received much family support during Minnesota’s National Senior Games in 2015 when he won a gold medal in the 200 yd. breaststroke and a bronze in the 100 yd. breaststroke. Congratulating him are his son, Burkelee; wife, Ginger; and son, Samuel; and daughter-in-law, Anna. Granddaughter, Cora, wears her Papa’s participant lanyard during an awards assembly in Plano, Texas, in September 2018. Lee right after getting out of the water during the ITU Aquabike World Championships in Denmark last year. 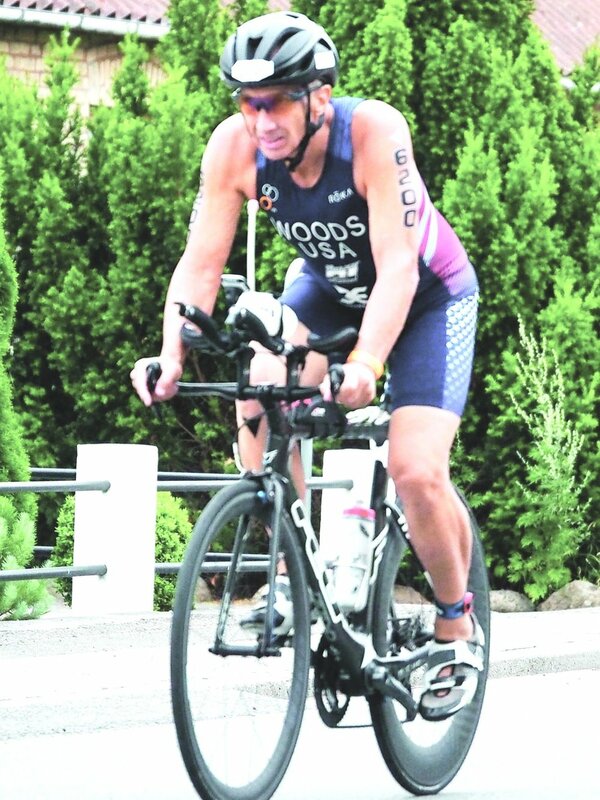 Lee riding his bike during the ITU Aquabike World Championships.